Glasgow is famous for some of the most impressive architecture in the UK with stunning sandstone buildings for both commercial and residential use. However the famous Scottish weather means and poor upkeep means that over time these buildings can suffer damage and need to be repaired. Balmore Specialist Contractors are one of the leading experts in building maintenance and repairs in Glasgow. 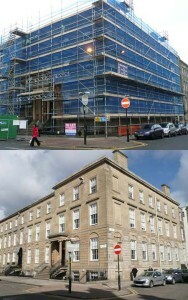 We look after and manage almost all types of properties from modern office blocks to historic buildings and churches. Our repeat-client base continues to grow due to the exemplary work that our specialist workmen carry out every day. We are not just another builders firm We are a fully trained and qualified team of building maintenance experts who provide expert care to ensure any facilities that we maintain are always looking and operating at their very best. There isn’t any need to worry about the condition and cleanliness of your property when Balmore’s building maintenance service is in action; it’s all taken care of. We ensure all repairs are taken care of, all safety checks are in place and regular cleaning is carried out. Exactly what you would expect from a reliable and reputable building maintenance company. Our buildings maintenance service takes care of your property, both inside and out. Repairs and work on it’s upkeep are carried out internally and externally. Your property will look great from any angle and will remain free of needing repair once our professional building maintenance team has carried out our recommended building maintenance service plan. The building maintenance service we offer in Glasgow and all across Scotland is second to none – we will do whatever we can to meet all of your requests perfectly. We’re not satisfied until we know you are 100% satisfied with our service. Get in touch with Balmore today to request our recommended building maintenance service – you’ll be glad you did.